Pink's Thinks: Run for your life, boys. No. Seriously. You know those arrow diagrams where you find out the answer to whether or not you should do something? I have one for this article. Ready? Are you male? ----> yes ----> Stop reading. Abort mission. Close browser. Go look out the window. Go think about something fun, like testosterone. Are you male? ----> no ---->Awesome. I'm going to talk about periods. And for all of you males who kept on reading, seriously, just get the heck out of here. I know you kept on reading anyway (you little rebel, you! ), and that was your warning flag, but I am about to open up a can of women business all up in here and you should just close up shop and wait for the next article to entertain you. This one is not it. Okay ladies, now that we got them out of here, let's behave the way that we always do when we are in the presence of many other women and no boys by waiting four to six minutes before we talk about the really juicy stuff, laughing maniacally, and ordering some ice wine (Oh. 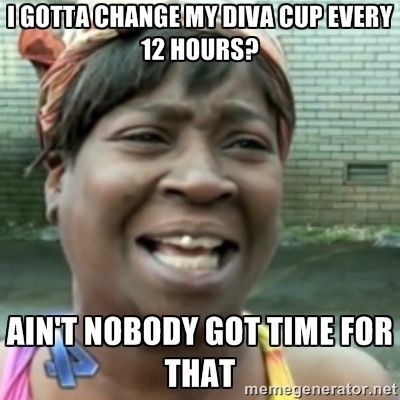 Maybe that's just my divas? What's up, divas! You guys, I am crossing into the new level of crunchy granola here. Just be warned.). About a year ago I was lost amongst the throes of youtube (pretty much 32 videos in and teetering on the verge of "how to ride whales") when I came across this young girl in England who made her own cloth maxi pads. I was like, "Wha? Cloth maxis? What the what?!" 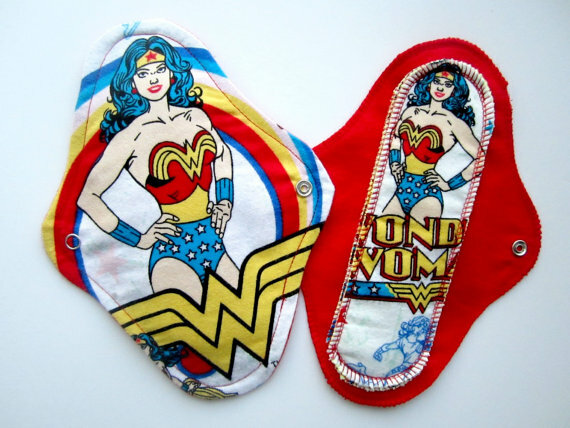 But the pad had Wonder Woman on it, so I clicked the link and watched her (um, hello. Did you hear me? I said Wonder Woman. Sold.). I did not even know this was a thing that people do. And then I thought about how I used cloth diapers on my child and then realized maybe it wasn't something to be necessarily terrified of. I started the research phase of it, reading up on it and then I came across a site that said they would send you a free trial one (if you swore on your Grandmother's grave that it really was your first time ever using one, cross your heart, hope to die, stick a needle in your eye, and I'm not kidding, I think they said you would get a hex put on you if you lied or something. These peeps are not messing around.). Luckily for me, it really was my first time trying one and I didn't have to think about lying to get a cloth pad. You could pay an extra dollar for organic cotton (SO I TOTALLY DID, DUH), I mean, really, do you want pesticide sprayed GMO frankencrops all up in your lady parts? No thanks. I'm set. So I sent them my address and a dollar, and all I had to do was wait. Wait I did. My sort of cute thin pad thingy came in the mail and I was like, oh my gosh, what the heck, am I really doing this? I had looked up some other pads in the meantime and they were like one zillion dollars per pad each to purchase, which kind of puts a damper on things (start imagining how many pads you would need per period, yeah, no.). So what genius idea did I come up with? I know! I'll just use the pad thing they sent me, make a pattern out of it, and go sew a bunch of them! I'm sure they have youtube tutorials on how to make them! Yes, this is a great idea! I sat myself down and figured out how to make different sizes of these baddies, got some organic cotton, some backing, some snaps, the whole nine, and made a bunch of these things. Then I called my sister. Me: Um, do you have ANY idea what I am doing? Me: This is the crunchiest granola thing you can even ever imagine. I mean, there's the line, and there's me, twelve miles past it. Sister: Oh gosh, what did you do? Sister: (LOOOONG PAUSE) That. is. so. unbelievably. gross. I can't even. You have crossed the line. Me: I know! Are you surprised? Me: So, you remember my cloth pad idea? Me: Uh, yeah, not so much. So I thought that was it for me. I kind of gave up the idea of being crunchy granola in the period department. I still wasn't comfortable with using conventional tampons with all their GMO-eyness and their pesticides all up in my business, so I switched to million dollar organic tampons for swimming. 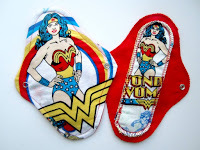 After wearing cloth pads for about an hour, I gave up on the idea - maybe it was because I had a horrible design, or maybe it was just because, OH MY GOSH, SO SICK, CLOTH PADS. Probably both. What was I thinking? Oh yeah, I was trying to save the world. Sigh. And then there I was. Standing in the health food store, buying another jillion dollar box of organic tampons when I glanced over to the left and saw the Diva Cups. 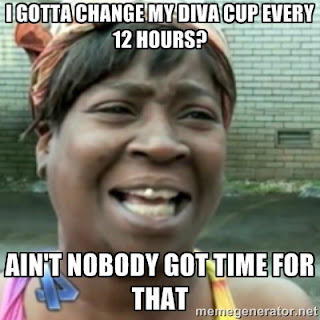 You do know what a Diva Cup is, right? It's basically this medical grade silicone squooshy cup thingy that you shove up your hoohah and you don't have to use pads or tampons. Yes, I've seen them there before, and I was like, no, that is not going to happen. But today was different. 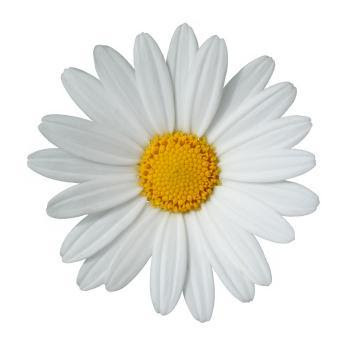 Today I saw the Diva Cup as a chance to break free from the jillion dollar organic tampons and as another adventure in the life of crazy Ms. Daisy. I bought it. I made sure to go to my favorite cashier so I could ask her if she has used it before (and also because she won't judge my weirdness, she already knows). She hadn't, and we just pretty much stood there in front of some stranger behind me (who likely wishes he could have evaporated from the face of the earth) and talked about periods and our qualms with using such alternative methods (I love my health food store, I mean, just in case I haven't told you that lately) and what happens to your cycles when you're in your 30s. 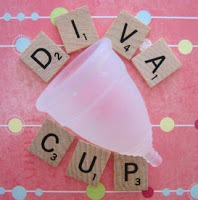 This glorious day was a day that I could actually try the Diva Cup (Oh, thank goodness, right? Yay. Periods. Not. ), so I took it home and read the instructions cover to cover (well, only in English and Spanish, the rest I ignored) and then focused my determination for figuring it out. After a few hours, I wondered if it was working, so I made a trip back to the bathroom. It seemed that everything was going well, but being the experimentally minded person that I am, I had to check what was going on in there. Now you can keep it in there for some absurd amount of time like 12 hours, and perhaps at some point in the future I shall graduate to such bravery, but at this point, I frankly am just not there. I decided it was time to check on things, and so I had to get it out. Meanwhile, back at the farm. It says that you can do anything while using it - including swimming. I am not sure if I am experienced enough (or brave enough) yet to try that out in the pool. Perhaps one day. But so far, so good. I feel a little crunchier already.